Is My Machine a Featherweight? "Is my machine a Featherweight?" Nova receives numerous inquiries regarding whether a machine is or is not a “Featherweight”. The model that Singer designated as “Featherweight” was the model 221. Technically, the majority of machines are model 221-1 due to a patent update. Size – Singer Featherweights are very lightweight, hence the name. They weigh only about 15 pounds in their little carrying case. The light weight is due to the cast aluminum body of the machine. The machine is about 15” long by 10” tall including the spool spindle pin. Later models manufactured at the Kilbowie, Scotland plant were shorter in length. Cases – Singer Featherweight 221’s carrying cases are rectangular boxes that resemble luggage cosmetics bags from the 1950’s. These measure about 13” x 8” x 12”. The size varied somewhat depending upon the year of manufacture. The colors were black, green, and tan with black being the most common. Singer Featherweights were never housed in the bent wood portable cases, were built-in to a cabinet, or had a removable top portion of the case with the machine remaining in the base. Motorized – All Singer Featherweights had electric motors. Folding bed extension – The sewing “bed” or base of the Singer Featherweight folds up on the left side of the needle. Belt driven from the motor – All Singer Featherweights have a visible motor and motor belt that drives the machine. Metal construction – There has been a plastic model dubbed “featherweight” in recent years, but it is not the model so highly prized by quilters and seamstresses. Nor is it the model that is my specialty and the focus of this web site. 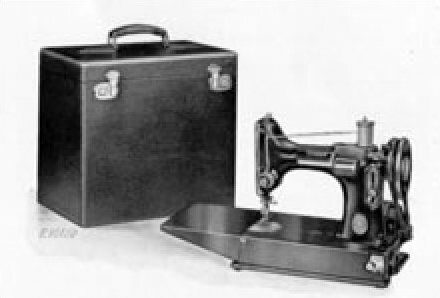 These are a few of the obvious features to determine if your machine is a Featherweight – “The most popular portable in all the World”. Click here for Nova's online store full of great products for your Featherweight. Click here to be directed to Nova's Featherweight Tip of the Month. Click here for information on Nova's Featherweight Maintenance Workshop. Click here for Nova's Motor Lubricant that every Featherweight (and other vintage Singer motors) needs.